In October of 1999, Portland Bolt was summoned by the contractor erecting the Millennium Force Roller Coaster at Cedar Point Amusement Park in Sandusky, Ohio to provide replacement anchor bolts when the original supplier provided the wrong product. Portland Bolt shipped over 20,000 pounds of 1-1/2″ diameter A449 rods with welded bearing plates in only two days to keep the project on schedule. 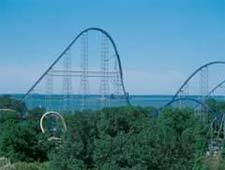 When the Millennium Force opened in May of 2000, it broke 10 records including the fastest and the tallest roller coaster in the world. The thrill ride stands an amazing 310 feet and hurls riders along 6,595 feet of track at speeds of 92 miles per hour.